The STAC6 series stepper drives are powerful, two-phase, bipolar step motor drives for high-speed, high-torque applications. With high bus voltage and high current output, STAC6 drives provide even the largest step motors with enough power to get the job done. STAC6 stepper drives employ sophisticated current control designed for optimal smoothness over a wide speed range. Anti-resonance, torque ripple smoothing, and microstepping work together to bring step motor performance to a new high. Power to the STAC6 drives comes from 120 or 220 volts AC (single-phase). To complement the STAC6 drives Applied Motion offers a specially matched set of low-loss NEMA 23 and 34 frame motors, all specifically designed with high voltage operation in mind. The standard STAC6 drives operate on 120 VAC and output up to 6.0 A/phase (peak-of-sine) to the step motor. The 220 VAC versions, STAC6-220 drives, operate on 220 VAC and output up to 3.2 A/phase (peak-of-sine). Protection features like over-voltage, over-temperature, and over-current keep all STAC6 drives running in adverse conditions. 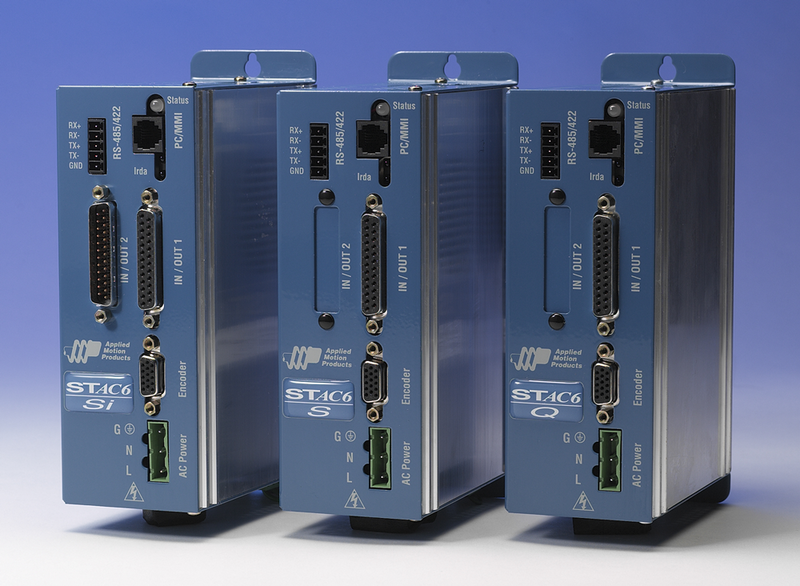 There are 4 control options available with the STAC6 stepper drives: S, Q, Si, and C.
“S” drives can operate in pulse & direction, velocity, and streaming serial (SCL) control modes, and are also recommended for use with Applied Motion’s SiNet Hub 444 and 8 multi-axis motion hubs. “Q” drives can operate in all of the same control modes as an S drive, plus they have the ability to run stand-alone Q programs stored in non-volatile memory. Q programs are created using the Q Programmer™ software, which provides multi-tasking, math functions, conditional processing, data register manipulation, and more features in a robust yet simple text-based programming language. “Si” drives can operate in all of the same control modes as a Q drive, plus they have the ability to run stand-alone Si programs stored in non-volatile memory. Si programs are created using the Si Programmer™ software, which provides unparalleled simplicity in indexer-drive programming via Applied Motion’s unique and powerful icon-based programming environment. The “C” control option means the drive is designed to operate on a CANopen communication network and conforms to Can in Automation (CiA) DS301 and DSP402 specifications. C drives support Profile Position, Profile Velocity, and Homing modes, as well as the ability to run stored Q programs via Applied Motion-specific CANopen objects. For connecting to external devices such as limit switches, proximity or photoelectric sensors, PLC I/O, lamps, and other devices, STAC6-S, Q, and C drives come with 7 digital inputs, 3 digital outputs, and 2 single-ended analog inputs (analog inputs can be wired together as 1 differential analog input). Additional I/O is available for Q drives by ordering the STAC6-QE model, which adds 8 digital inputs and 4 digital outputs to the base I/O. STAC6-Si drives come standard with 15 digital inputs and 7 digital outputs. All STAC6 stepper drives come with RS-232 ports for configuration and programming. S and Q drives also provide RS-485 ports for streaming serial (SCL) and Q commands over serial networks with up to 32 axes. C drives come with a CANopen port for connecting to the CANopen data network. All STAC6 drives come with an encoder feedback connector for applications that demand a higher level of position control than ordinary open-loop step motor systems can provide. Use our double-shaft step motors with incremental encoders and activate either Stall Detection or Stall Prevention in the STAC6 drives. Stall Detection notifies the system as soon as the required torque is too great for the motor, which results in a loss of synchronization between the rotor and stator, also known as stalling. Stall Prevention automatically adjusts motor speed to maintain synchronization of the rotor to the stator under all conditions. This unique feature allows step motors to operate in a much broader range of applications than previously possible, such as torque-control. The Stall Prevention feature also performs static position maintenance, which maintains the position of the motor shaft when at rest. Additionally, the inclusion of the optional encoder allows the motor to be precisely homed to the index (marker) pulse. Standard STAC6 drives (120 VAC operation) are UL Recognized (File No. E310506), CE approved, and RoHS compliant. STAC6-220 drives (220 VAC operation) are CE approved and RoHS compliant.